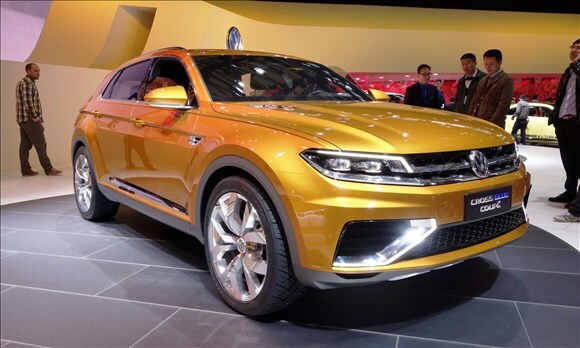 Volkswagen CrossBlue Coupe was introduced at the Motor Show in Shanghai. The Volkswagen Company published the official pictures of a conceptual crossover CrossBlue Coupe. The premiere of a vehicle will take place at the Motor Show in Shanghai. The novelty is equipped with a hybrid power plant including a gasoline V6 engine and an electric motor. The total output of the power plant is 415 hp. 0 to 100 km/h takes just 5.9 seconds. The concept car will be able to move by the electric motor 33 kilometers. Admittedly, the concept model is a precursor of a new generation of a crossover Tiguan. Volkswagen to launch five new crossovers by 2020?